30% compared to other welders in its class. sticking during short arc length welding. and recoil start. Idle control and low-oil shutdown are standard. Full-panel GFCI protection that is OSHA and NEC compliant. 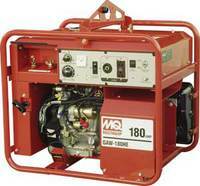 * Please call us with any questions about our welder 180 amp gas portable rentals in Lake Charles and Moss Bluff LA.